In a large measuring cup or deep bowl, whisk to blend the chopped garlic, lemon juice, balsamic vinegar, Worcestershire sauce, mustard and pepper. Slowly add the olive oil while whisking vigorously. Set aside. Cut each chicken breast in 8 lengthwise strips. Pat the chicken strips dry with a paper towel and place them on a plate. Sprinkle the chicken strips with coarse ground pepper. Heat the canola oil in a frying pan over medium high heat. Fry the chicken strips for about 5 minutes or until the chicken is cooked through and brown on the outside. Break the romaine into bite size pieces. Pour the dressing over the romaine and toss well to coat the leaves. Sprinkle the salad with grated Parmesan cheese. 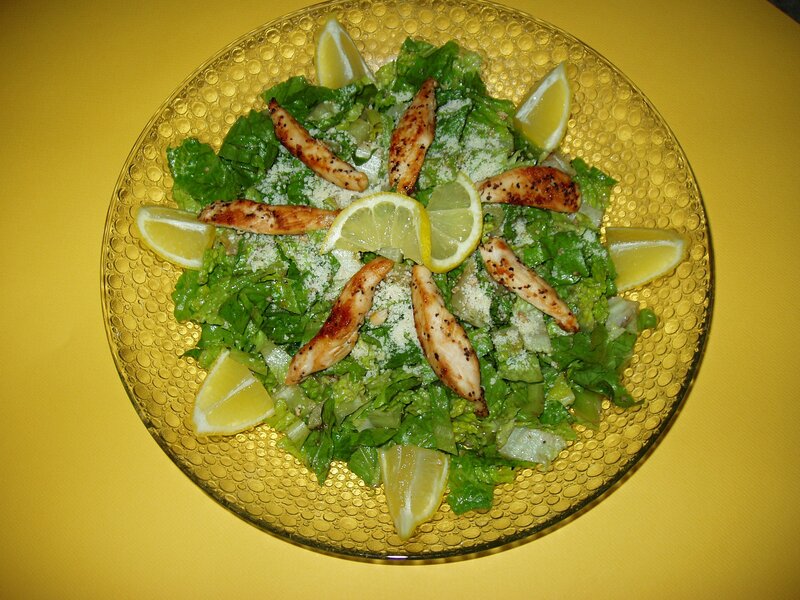 Garnish the top of the salad with the chicken strips and lemon wedges.